A dramatic image to end the week. 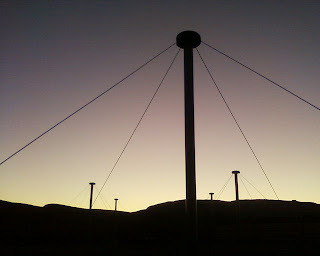 This photograph was taken looking up past the Low-Band antennas towards the the western skyline near Iso-Malla. With a stunningly clear sky it is perfect conditions for seeing the aurora. We've had a successful week, this week, so it seems fitting to finish it with a shot of the aerials where the radio waves from the depths of space first make contact.